Stem cell news is always burbling up, sometimes right there in front of us on the web and other times via networks of people. Astellas news. Some may remember there used to be this pioneering stem cell biotech called ACT, which then became Ocata, and finally was acquired by the big company Astellas. One of their areas of focus was on using pluripotent stem cells for macular degeneration. The driving scientific force was (and is) Dr. Robert Lanza. About a year ago I had a very brief update from Bob on where things stood then at Astellas, but now thanks a reader, we have some new stem cell news here and know that there’s an updated active trial listing for Astellas for the former ACT/Ocata-related work. The actual study start date is now listed as just last month. Take a look if you’re interested in the details, but I’d say this is a small bit of encouraging news. This is an admittedly nifty mouse study, but because it’s in mice and uses a marker gene, there’s a very long road ahead before even remotely getting close to the clinic (the paper itself is here). Note that some folks are also excited about using CRISPR for cystic fibrosis as well. Loss of H3K27me3 Imprinting in Somatic Cell Nuclear Transfer Embryos Disrupts Post-Implantation Development (See Figure 2c above). Astellas trial: does anyone know what the difference is between the earlier line they were using MA09-hRPE and this new one, ASP7317. PubMed lists a couple of dozen papers describing the derivation, the cell biology and cell state of the former, but nada on the latter? Previously, prior to Astellas, Ocata/ACT had been discussing bridging to a NED-hESC line (described here: https://www.cell.com/cell-stem-cell/abstract/S1934-5909%2807%2900330-X) as the MA09-hESC line used was not fully documented as required (potential roadblock to licensure issue mentioned by mgt.) and also the Blastomere technique used to create the line wasn’t preserved. The paper mentions 5 lines created with scientists from StemLifeLine, Inc. (Ana Krtolica & Dusko Ilic). Their method work is also documented in a patent application, which you can look up. The first 4 of the NED lines were submitted to the NIH hESC registry – I believe they’re still noted there. NED 5 (the one mentioned in the Cell Stem Cell paper without hESC co-culture) wasn’t submitted to the NIH. Evidentially a NED 7 line was also created and Ocata/ACT mgt. discussed bridging using that line. No details of this NED 7 line were made public then. The time issue of having to process a switch to a new cell line as an early clinical phase program, in addition to the financial burden on the company plus the lightning rod focus, was a huge overhang on the small public company and thanks to Astellas’ lifeline they enabled the visionary science of Dr. Lanza and team to continue. What happened with the cell line issue after Astellas took control of the company is a very good question – one which I’m curious about also. Perhaps Paul can enquire when he next speaks to Dr. Lanza. Glad to see the clinical trial status of the RPE trial as active again – thx for the update (and also Irv if it was you with the eyeballs on clinicaltrials.gov). Many thanks Michael, that explains the rationale and origin question, and assuming the cells are, at least in animal models, functionally as good or better that M09-hRPE then the story picks up from MA09-hRPE. As a stem cell noob I am a bit stuck on the workflow for transplanting these cells. If ASP7317 is a replication competent line, it cannot be the fully differentiated hRPE that will be transplanted, i.e. post.mitotic hRPE, so does Astellas use a procedure to derive hRPE from ASP7317 and would this mean this is done for each patient? I guess this is the same as Jun Takahashi´s workflow? Yes, one would assume the pre-clinical work of the line selection met, at a minimum, the criteria that the MA09 line went through (evidentially it was the best performing line at the time for selection, I recall). There were culture/feeder issues that Biotime, for example, circumvented (xeno) in their clinical RPE line. However, there is a different methodology when using directed differentiation protocols. Perhaps given the advances to Ocata/Astellas’ method and in the cell derivation field generally since MA09 and the NED lines were created (over 10+ years ago now) there may well have been other advantages to it being updated with a newer cell line. Question remains on whether the NED line was used for the bridging or another line created more recently. Agree, captivating storyline arc.. I hardly believe you’re a noob Gary, unlike me, that wishes he was selecting his major at a CA Uni. These types of pluripotent products are Allo and manufactured to a clinical grade release criterion. 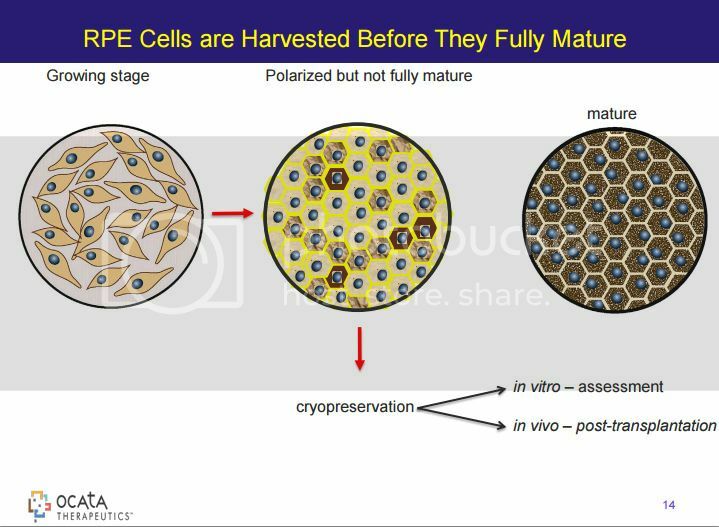 Personalized cell therapy approaches have been a key driver in the sector and also go through a cGMP process, but they employ an Auto cell approach – meaning the cells come from that patient. This would also be true even if the therapeutic cells used a reprogramming method via a pluripotent state – aka Jeanne Loring’s work and patient #1 in Masayo Takahashi’s RPE program. I’m not familiar with Jun Takahashi’s derivation method protocol – although the program is stated as an iPSC derived Allo product, rather than a personalized Auto therapy. What is the status of the new ASP7317 product in this regard? That is another good question for Dr. Lanza – I suspect it would be similar in regard to there evidentially being “sweet spot” cells in the cascade pathways of differentiation, depending on what you want the cells to do and where/how they’re being applied. Universal Cells’ tech and Astellas’ acquistion bodes well for the translation of stem cell therapies – research work in this area is a potential solution for Allo cell therapy immunogenicity issues. It would be nice to find out about the cell line. Earlier this year Astellas bought Universal Cells, a company that developed technology to mitigate the rejection issue. Here is a link to the Astellas 2018 presentation about their strategic plan, in it they discuss the Universal Cell applications they intend to develop and it does show ASP7317. The first patient was dosed I believe in mid July and they are saying a patient population of 150 folks.